The two main pitfalls of robots which imitate the human body are their control and the difficulty encountered when manufacturing them in a cost-effective manner. Researchers from HBP's partnering project MoCoTi have designed the prototype of an android which learns how to actuate its own limbs and can be easily duplicated. 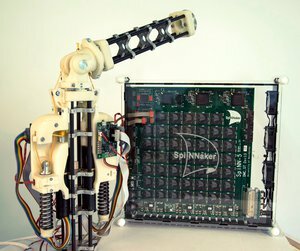 The device, formed of an artificial brain which controls a tendon-driven robotic arm, might be the first step towards low cost humanoid robotics. Robots which behave and feel similar to humans are becoming a reality. They are made up of a musculoskeletal hardware which imitates the human body and a neural control software which simulates parts of the brain. One problem of these devices is the difficulty faced in trying to produce them in series in a viable manner. Scientists from the European projects MoCoTi and Myorobotics have created a robot which can be easily reproduced and aims to become a ‘low cost android’. “This is possible because its modular design permits a relatively efficient mass production,” Christoph Richter, lecturer at the department of Electrical and Computer Engineering of the Technical University of Munich (Germany) and one of the leading researchers for MoCoTi, explains to SINC. This project is now being presented at the Human Brain Project summit in Glasgow (United Kingdom). In order to imitate the muscles and articulations of the human arm and give the robot increased mobility, the scientists have used the Myorobotics system. Nine muscles formed of mechatronic devices are coordinated to control the spherical articulation. One of these, linked to the biceps, is joined to two articulations connecting the shoulder to the elbow. The next step is to design an artificial cerebellum to control the orders from the locomotor system. “The neuronal structure of the cerebellum is relatively simple and uniform. We reproduce the most important neurons, their connectivity and – importantly – their adaptation and learning in our real-time simulation,” states Richter. To copy their behaviour, the researchers selected a neuromorphic computer platform called SpiNNaker developed at the University of Manchester (United Kingdom). Compared to a desktop computer, its performance is far superior: a single chip can manage a network of 10,000 neurones in real time. Thousands of chips can be interconnected to simulate sizeable, brain-scale neuronal networks. The prototype learns to move in a controlled manner, “including the timing and control of the posture,” claims Richter. Its advantages include its elasticity and that it can be controlled, an important aspect in the human-robot interaction. According to the researchers, it is possible to incorporate higher order brain structures such as the cortical networks, and neuromorphic vision and hearing, using so called silicon retina or cochlea sensors. Androids of this type, with increasingly more realistic simulations, will be a very useful tool for studying the brain, say the scientists in the paper published in the ‘IEEE Robotics & Automation Magazine’. “The robots will be able to help in the progress of neuroscience just as neuroscience helps us to create more natural robots,” highlight the authors, who include scientists from the University of Granada. MoCoTi is a Partnering Project of the Human Brain Project, an initiative of the Future and Emerging Technologies Flagships (FET Flagships) of Horizon 2020, the framework programme for funding research in the European Union. Christoph Richter, Sören Jentzsch, Rafael Hostettler, Jesús A. Garrido, Eduardo Ros, Alois Knoll, Florian Röhrbein, Patrick van der Smagt, y Jörg Conradt. “Musculoskeletal Robots: Scalability in Neural Control”, IEEE Robotics & Automation Magazine 23 (4), December 2016. DOI: 10.1109/MRA.2016.2535081. This article was produced by SINC. SINC produces scientific news for the European project SCOPE, coordinated by FECYT and funded by the European Union through Horizon 2020, its funding program. The SCOPE mission is to communicate visionary research results of partnering projects in the framework of the Graphene Flagship and the Human Brain Project, as well as to enhance the FET Flagships partnering environment in the European Union. Photograph of a simpler Myorobotic arm connected to the neuromorphic computer platform SpiNNaker./Sören Jentzsch.